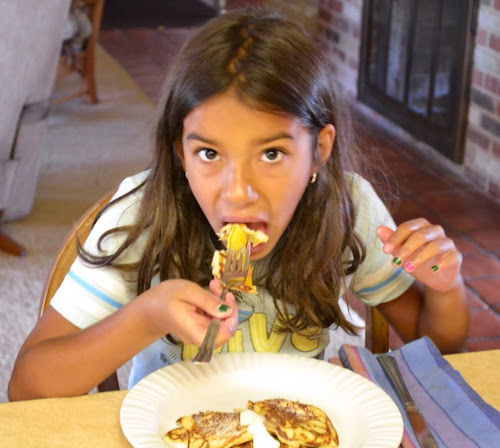 Over at Julie's: There's a New Pancake in Town! There's a New Pancake in Town! This weekend we enjoyed the company of A.J. and Hannah, two of our Grands! 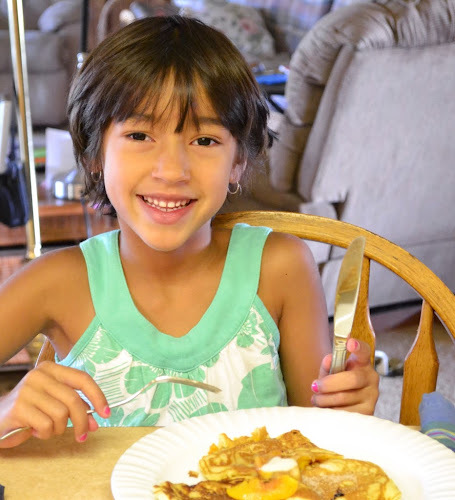 Breakfast is A.J's favorite meal of the day, so I decided to make pancakes using some of our late peaches . . . We all loved them! I've eaten chocolate chip, banana, blueberry, apple, buckwheat, oat, wheat, huckleberry, German, lemon, and even blackberry, but never peach pancakes! There's nothing like sun-ripened, organic peach slices, dusted with a touch of cinnamon sugar added to your buttermilk pancakes! 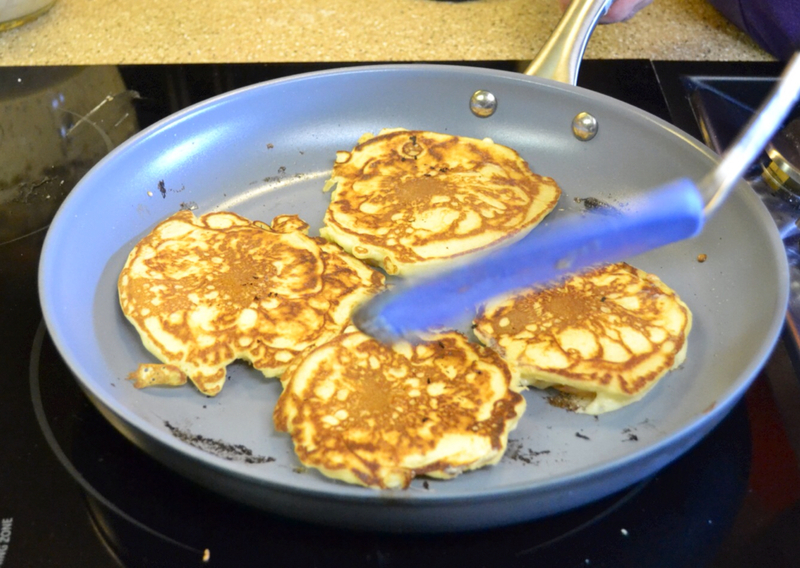 You can make your own "homemade buttermilk", and produce light, tender, tasty pancakes! This buttermilk pancake recipe is incredible, and tender cinnamon-kissed peach slices take it over the top! Oh yea, I have found my new favorite pancake . . . PEACH BUTTTERMILK!!! Hannah and A.J. . . . ready and very willing taste testers! Make up a batch of "homemade buttermilk" by mixing your milk with vinegar and letting it sit for 5 minutes in a hot water bath. Preheat skillet or griddle on med-high heat. Mix up cinnamon sugar; set aside. In a large bowl ~ Whisk (mix) eggs until frothy; add milk and whisk (mix) well. In a medium bowl ~ Whisk dry ingredients together. Add dry ingredients to wet; mix just until all the dry ingredients are incorporated. TIP: * Pancake batter should have the consistency of heavy cream; if batter is too thick, add a couple tablespoons of extra milk. Slice washed peach into thin slices, lightly sprinkle with cinnamon sugar. To greased skillet (I use a basting brush to grease my pan with coconut oil), add pancake batter, about 1/4 cup per pancake. 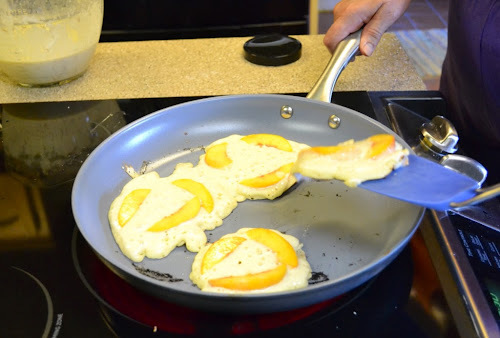 Add 3 peach slices per pancake to the cooking pancakes. Cook until bubbles appear; flip and cook 2 more minutes. Place Buttermilk Peach Pancakes on serving plate; keep them warming in oven on its lowest temperature. Serve pancakes hot with butter and cinnamon sugar. 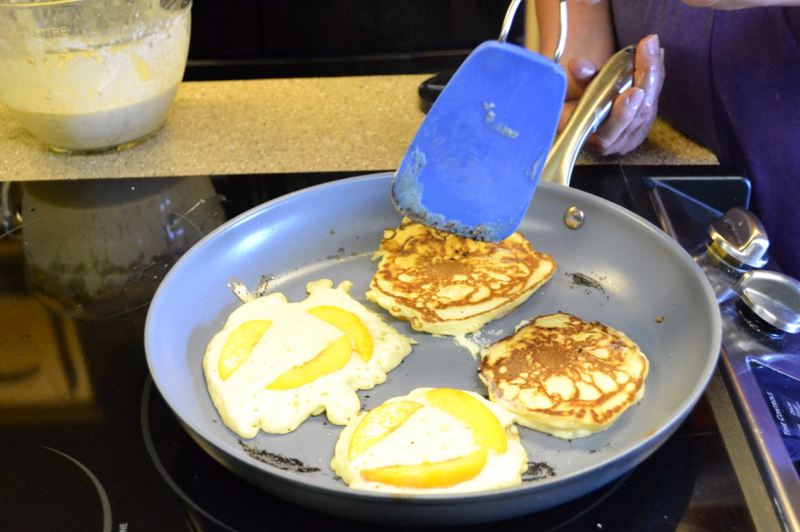 Cook pancakes until bubbles form, then flip. A.J. ate 7 Peach Buttermilk Pancakes ! Will and I each ate 4 Peach Buttermilk Pancakes. Our parrots Libby and Evergreen shared one! The conscensus? We will definitely be making these again and again . . . Over at Julie's, because they're that good!! !